Once you have completed Part 1, you’re ready for Part 2! In this advanced workshop, you’ll take the theory and product knowledge you learned in Part 1 and put it into practice. You’ll spend most of your time in our hands-on area collaborating with your peers. 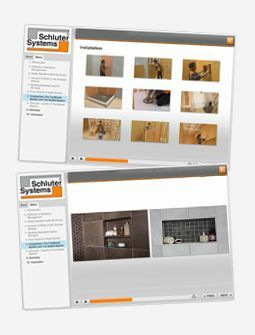 The goal of this workshop is to bring your product knowledge up to the next level by using a variety of Schluter® products in some common, yet challenging installations. See how our products integrate to create bathrooms, built to last a lifetime. 1 Comes Before 2! Remember to attend Innovation Workshop Part 1 before registering for Part 2! This class is for attendees who have completed Part 1 of the Innovation Workshop and have a solid understanding of the fundamentals. Part 2 covers more advanced applications, with 35% of the time in the classroom and 65% of the time in the hands-on or live demo area.